I suffer from severe peripheral neuropathy. 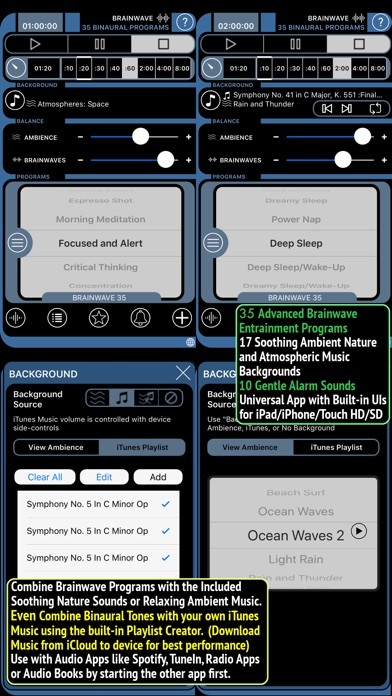 I use this app on “Anxiety” with Ocean Waves setting with my Bluetooth headphones every night to help me fall asleep. This has been going on for months. This is probably the most important app I own! Awesome to listen to sleep/ nap and I highly recommend preworkout energy.while working out! I could never quiet my mind to meditate and a few years ago, read about binaural beats. Purchased the app, used it while coding programs, getting rid of a headache, being more alert, sleep through the night and awake at the right time but the ones that I am still using years later is for meditation. Clears the clutter so I am open to spirit communication. This app is my go-to at work when I need to induce concentration, creative thinking, or even to perk up my energy. At home, I use it at bedtime to sleep. And I even use it when I’m feeling anxious and need to invoke a sense of calm. It’s indispensable, and I can’t recommend it enough!!! I’ve been using this app for years and love it! It’s perfect for overnight flights where you really want to be able to sleep but your body says “It’s only 2:00 pm.” I put on eye shades, plug in my noise-cancelling earbuds, put on Enya in the background, and snooze the flight away, arriving in the morning in Europe having slept pretty well! Not sure if it is placebo or what, but during the last 3 years I have been using the app for concentration and creativity when I have to write (one of my least favorite activities) and it has worked. So 5* for this. I still have to test it in other situations and I'd be curious to see if it works. Purchased the bundle and found it to to be more than accommodating and well worth it to drown out the background noise life can often present us with 💙 Thank you for developing this app!! This app has really helped me at times when I can’t sleep, need to calm anxiety or boost my mood. I love all the different options and that the sound levels are adjustable. I use brainwaves for meditation, relaxation, and going to sleep. I can use my own music or meditations. I have been using this app for a couple of years now often on. It really does work! I have used the “Deep Sleep” program and the “Headache Relief” program the most frequently. They really do work! After using the sleep program, I hd the deepest sleep that night as well as more vivid dreams than usual. The headache relief program is helpful for the occasional migraine that I sometimes get. The layout of the app is very natural, and the buttons are in all the right places. It’s very simple to use and has a very clean interface. The color scheme is appropriate, too. Well done! The only complaint I have about the app is the limited selection of background music and background sound effects. While the selections are good, they have a somewhat amateurish quality to them. I feel that they could be greatly improved and expanded. Another thing that would be nice would be the addition of more binaural beats — if possible — for different things or for things of a very specific, direct nature. HIGHLY RECOMMENDED! UPDATE: This app is a must for anyone looking to improve the quality of their life. Like others have mentioned this is not a cure all, but coupled with a lifestyle and positive intentions it will reinforce your sleep, work, energy, etc. It is also EXTREMELY beneficial for anyone with ADD. I have had this app for 2 years and I can definitely say that the deep sleep module will put me fast to sleep. I also use the focus/concentration mod while working and can easily get into a zone and get all of my tasks done. This app is a must have for any life or bio hackers! Great app! All settings really work! I’ve been using this app for a few years-for different reasons-and I’ve never been disappointed. Whether it’s in deep sleep, relaxation, lucid dreaming, or headache setting, I’ve found they all work for each unique need. It’s also cool you can tweak the setting like volume on waves and ambient sound. Great app! Not sure if the brainwaves or the background noise helps me fall asleep. I use this when I travel because I can’t take my white noise maker with me. I love this app! I use it for sleep. It helps block out city noise and slows my mind down. I would much rather listen to it than to take a sleeping aid. I also use it for concentration when I need to get projects done. It is very versatile and it works very well! I use this to help fall asleep on many nights when my apartment is too loud. Promotes sound and deep sleep. Also helps with alleviating migraines, especially if you don’t always want to be popping pills. The app itself is extremely well done, user friendly, and overall a great experience! The only thing I hope they add is to be able to skip to certain parts of a song, for example I have music mix’s that are an hour long and if I want to listen to the last 20 minutes of the mix I can’t. The songs alway start from the beginning, which is usually fine but in most cases I use mixes so I don’t have to download 50 songs just one mix with all of them. I hope they notice this and take it into consideration because sometimes I won’t use the app just for the fact that I want to listen to other parts of the mix. Otherwise the app is amazing and no other complaints! I love this app. I use it to work, to sleep on airplanes, when I need to be productive, and when I’m reading a book. I can concentrate like nothing else! I really enjoy listening to these tracks. They put me in a meditative state every time! In the past I have used this app when I was traveling and staying in hotels. I always got a great nights sleep and woke up refreshed and ready for the day. I have also used it for a short 30 minute afternoon nap. Wow was I ever pleased with how refreshed I felt afterwards. I just started using it at home every night. Sleep issues are no longer a problem. I love this app!! 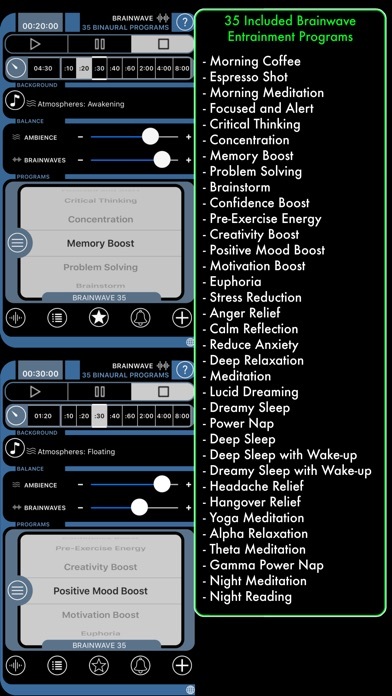 I have had this app for 2 years and I can definitely say that the deep sleep module will put me fast to sleep. I also use the focus/concentration mod while working and can easily get into a zone and get all of my tasks done. This app is a must have for any life or bio hackers! 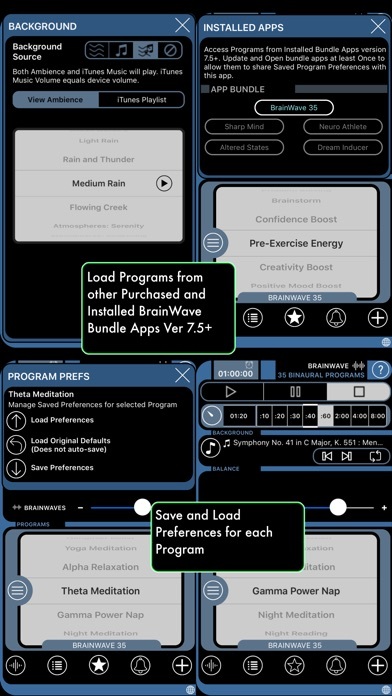 With 35 to over 80 professionally designed binaural sequences, (I have tye complete bundle) the ability to customize the length of any session, including the advanced multi-stage sessions, AND integration with Apple Music to construct almost any kind of hypnosis, meditation, or performance boosting program you can imagine, this application reigns as the king of iOS binaural sound programs. Only two additions would make this 100% perfect: the ability to use YouTube audio in addition to Apple Music, and the ability to use two outside audio sources (or the ability to import audio into the included ambient library) at different volumes. Purpose — brainwave entrainment, with personal music choice and personal custom affirmation track at subliminal volume. I’ve been using Brainwave for over a year and have my kids using it when they’re having trouble focusing on home work. It works for all of us, by calming and focusing. Give it a try. I actually love this app but it heats up my phone like crazy! I’ve recommended it to everyone that I know and I travel for work so we all love it. Don’t underestimate the power of bineural brain stimulation! This app is so beneficial with focus and concentration. Also great for relaxation and sleep. I highly recommend this app. LOVE THIS APP. LIFE CHANGING. Would highly recommend this app. I use it daily to help me relax or sleep. I absolutely love this app, and use it almost every single day to meditate. Love that I can change the background music, as well as set the BrainWave program for whatever it is I need that day. Thank you for creating this! Scrolling through the different beats does not work. Stuck on Morning Coffee. Can’t see the options. When I close and reopen it is in landscape view and you can’t see the interface. It won’t turn back to portrait. Email button not working to report the problem. Reloaded with no change. Using iPhone with current OS. I love this app. I don’t understand the science involved but this has always been helpful with my studies. The user interface has grown lackluster and I wish the app developers would update it. The only other request I have is to make it available for macOS. I constantly have to switched headsets with my Mac and my phone just so I can use his app. Excellent app. Use along with deep breathing - very useful for winding down you mind from a stressful day. I even sleep listening to it all night some days. I use his daily to maintain focus at work. Recovering from a traumatic brain injury and struggling with headaches and sleeplessness, BrainWave has given me the chance to regain some sense of normalcy. I am able to more effectively center myself and find calm in my chaos. A great app. Fantastic app, I use it all the time!! I just wish you could link it to your Spotify account, that would be incredible. I've owned and used the complete collection of Bandai apps for years but never spoke up. Bandai makes the most multi-purpose multi-function apps that adapt to every need. I use it for "walking meditation" during the day, or during exercise. I use this app everyday when I’m working on my writing projects. It keeps me focused and I’m able to concentrate without getting distracted. I just wish there was a desktop version. I’m slightly ADD. If I need to stay focused on a task for hours on end this is the key to success! You want this! Versatile, I use this for sleep, study, work and general relaxation when I’m tense or stressed. Out of hundreds of apps, this might be the one I’ve used most. It’s on every mobile device I own! 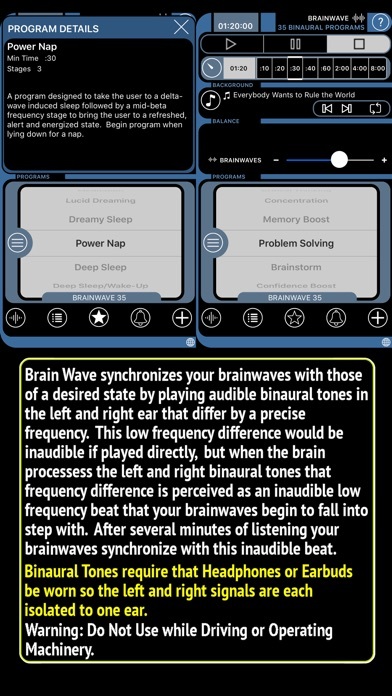 I love this app, the whole brain waves thing truly does work and I use it every single night before bed. Unfortunately it started acting buggy about a year ago and has been problematic every since. It often freezes so that the sound is still playing but the timer or buttons won’t work. This sometimes causes the app to keep running all night until the battery of my phone or iPad dies. It’s annoying enough that I have started searching for an alternative app. I use this almost every day. I listen while I'm reading, studying, I sometimes use it while listening to other music. It's incredible - seriously improves my focus, whether I'm listening specifically for that purpose or not. It has helped lift my mood after a stressful day and helped me get through finals without losing too much sleep. Very glad I made the purchase. I have been meditating for almost 50 years-various techniques. I have achieved a new higher level using different waves, especially theta. Frequently I can become centered in 10 minuets, even when feeling stressed. I use this app nearly every day for meditation, napping, or sleeping. So reliable and easy to use. It works faster than chamomile tea for getting me back to sleep when I wake up in the middle of the night (usually less than 10 minutes). It's the most useful tool and most-used app on all my devices. I've used it with my own music as a background, but find the soft sounds of the tracks that are supplied with the app to be perfectly adequate. I've also used the programs for headache relief, euphoria, and creativity with varying degrees of success. Edit: a year later, and all this still applies. I've started recording my own guided meditations and continue to use the brainwaves as a background. They still work brilliantly. Love this app. As a musik novice, being able to easily and simply mix binaural beats for sleep, can be difficult to achieve for me. Pain and anthropogenic electromotive forces heavily interfere for the mind of mine. Therefore finding tracks and methods that work can be an adventure. This app does it all, and gives you the option to add music tracks from your iTunes musik library. The only way to make this app any better is to allow adding mp3s from even one of the major clouds. Such as OneDrive, DropBox,or even iCloud Drive itself. The reason this is of want is because Apple Inc. Has decided meddling with iTunes syncing with this iPad is a great way to promote the competition. That leaves people, such as me, without a want to add or own music tracks to neither iTunes nor BrainWave BiNaural Beats app. I love love love this app! Still using years later. I can sometimes be easily distracted by noise. This app helps me to endlessly stay focused! Probably use it twice a day. When I need to get in the zone, it's the best tool I found out there to help me stay focused. I really don't know what the brainwave part really works or not – all I know is the result is there. I use use it everyday! Sure, it’s relaxing! I have listened every night for a month. I can’t tell you one Way or the other if my Pain is improved, depression lessened or my sleep is more sound?? Since I can’t specially say that it’s “changed” or I feel great, then I can’t officially say that it’s working either? My hopes were high from what I read. I also find it less than user friendly.... when trying to add my own music that is. As someone who spends a good amount of time in deep thought this program is a non-medicated way for me to clear my mind. I find that it works very well for my needs. I have been using this app for years now and it does what it promises. I love this app and sleep with it nightly (and have for years), but sure would appreciate adding new Sounds! I love this app! The alarm clock option is a great add on that others miss out on! I can’t wait to see what they add next. And I say that from a place of having experienced some real and surreal consciousness expansion, hair raising stuff involving meditation, yoga, sleep deprivation, nootropic supplements, fasting, etc. It works. And it is powerful and connecting and as intentional as all get out. Try as many combinations as possible to find what works well for you, especially for concentration, relaxation, and meditation. Some of the background songs are truly beautiful in simplicity and you can also play spoken word guided meditations through Spotify or BandCamp simultaneously. I have a hearing disability and this app wakes me us on time every AM. It’s literally a lifesaver. Can not do with out it! Outstanding app that really helps me focus and concentrate no matter the environment. I have been faithfully practicing B.E. every single day for the past two years and had to rely on YT to find which program to use but I had to do some research first so that I knew what I needed. THANKFULLY I found this app and ended up getting every app that they offered for B.E. Using the app is so easy! Now when I have a specific reason that I need B.E. (to wake up, need to focus, realax, and to get an amazing night sleep) all I do is dial my needs, put on my headphones, and chill for the recommended time or longer. B.E. has literally changed my life! I use it for depression, addiction, meditation, headaches, tiredness, motivation, and anything that I need! I'm not the type of person who goes along with fads and products with a million claims, I'm REALLY NOT! However, B.E. makes claims that are scientifically proven over and over again. You don't even have to have to do any research to use the app, you just need a reason to use it. Put it this way, if you breath, you should practice B.E. because your entire life, outlook on life, your health, and general well being will all change for the better, and all that you have to do is...get this app! Good luck and God bless. Dani W. Baltimore, MD. I would enjoy this app so much more if it was functional. The scrolling menu never works to allow choosing of programs. Just stays frozen most of the time. Sadly because of this I will likely delete the app. Great but, please fix the Deep Sleep program? There are six stages for the Deep Sleep/Wake program, but only one for the Deep Sleep (sans the waking sequence). 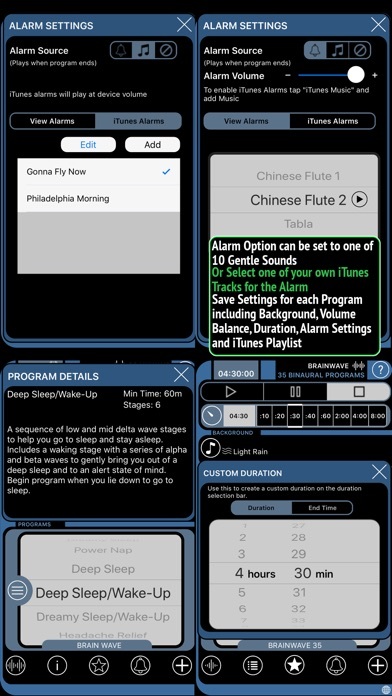 I have been using this app for a number of years and it works great but, the original Deep Sleep program (no waking sequence) was also six stages... and it was AH-MAZING. That was my go-to program but was rendered ineffective once you made it one stage. Can you please change it back? It helps me rest even when I can’t fall asleep my mind meditates and it rests. Great for lucid dreams too. Overall it is a great help for keeping mind psyche body balance. I have been using this app over the past few days, and I can say the binaural frequencies have delivered as promised. I have had great workouts, positive mood boosts, and enjoyed being able to create a playlist from iTunes to overlay. No downsides so far! Bottom line. It saved my a## in law school. With all of the distractions, I am able to tune my brain to the situation required! Really, I don't write reviews. I'm now practicing And I have a family! I'm just saying that I'm really busy... But! This app is truly awesome. It works. I've shared it with a few friends an they use it regularly especially the "Power Nap". But, the Concentration setting is super! And I say that from a place of having experienced some real and surreal consciousness expansion, hair raising stuff involving meditation, substances, supplements, fasting, etc. It works. And it is powerful and connecting and as intentional as all get out. Those in the know know what I mean. Haha. My wife and I use it nightly to get a refreshing sleep. Without it I do not feel refreshed even if I slept a long time. It works for us. ADHD is a problem that I address daily, resisting distractions and focusing on the task at the top of my prioritized, daily to-do list. It’s not always easy, especially when tired. What I now know for sure is that BrainWave makes it easier. It also gives me hope, not in the same way that prayer does, but alongside it. The obstacles including Cochlear implants and pain management are less of a burden. I found out about the concept from a very dear 85 year old friend friend, who is remarkably regaining his mental and physical strength, much like he was 10 years ago. I have found out about other treatment programs, but this one is immediate, easy, and enjoyable. Love all the different programs. Although I’ve been working out for years, this is the first time I’ve been able to “exercise” my mental and intellectual capacity. Wow. If you told me 6 years ago how much I’d be using these apps, I’d laugh at you. But I use Brainwaves for working, relaxation, sleep, meditation and creative writing. Have shown so many people in my life. This is a great app, I use it for everything: to study, before exams, to focus when doing schoolwork and reading, and to calm down and get sleepy before bed. Thank you for this great app. It does it all, and I also bought the other apps they make for sleep, etc. Not only while I sleep or nap, but also focusing at work, during creative writing and drawing, on airplanes to concentrate, relax or tune out noise. This app hasn’t been updated in years. Like YEARS. Note the screenshots and lack of tall-screen support, ignore the “last update” date. Misleading. It kindof mostly works. UI is confusing as heck. Why can’t I change the pattern once playing? It’s just a picker? Why gray it out? Why does it skip every now and again? Why if I try to many tones does it start skipping so progressively-worse that I have to kill it? This app seems to have pretty good tech. I just wish it had better execution. 10/25/2017 Since getting the update on my iPhone this app is all messed up and I love this app!! Love it! Have used it for two years, for school, meditation, and to help me sleep. Works every time!! I use on a daily basis, but now sound shuts off once another app opens or phone sleeps. I have been the big recommender to all my fiends. Sorry Maharishi but this works pretty well. Sadly, this one causes headaches for me. I wish this wasn't the case as I like all the choices it has. I just purchased the big bundle yesterday, is there any way I may get a refund? Great for getting in Flow! I’ve been using this app forever...probably going on 4-6 years. Helps me shift my attention from internal noise of mind chatter to focusing on creative endeavors where I really come alive. Definitely love this app! I've been using this app for about 2 years now. I throw my earbuds in and use my preset white noise sound mixed with whatever the intended wave setting I want. Works great. As an over the road trucker sleep and getting it when you can is important. I travel a lot and use this app through all the crazy transitions. Also amazing at bedtime. Have several similar apps, this is the best by far! I use this app often. It amazes me at how fast I can fall into a deep sleep with the alpha relaxation. I use concentration along with a few others when I'm working or listening to instructional videos etc. These are very helpful and enjoyable. If you told me 5 years ago how much I’d be using this, I’d laugh at you. But I use Brainwaves for working, relaxation, sleep, meditation and creativity! I've used Brainwaves Deep Sleep every night for several years. I also use Power Nap often. Both are incredible. Recommended by my doctor. I listen 20 minutes a day with headphones and it helps a lot. Amazing. Love that you can adjust the sounds so many ways and, if you choose, add your own music or audio book. I use this all the time and love it. The only thing I would change is the sound. I listen to this with music over it and I always want to turn it up higher without making my music louder. This really works! I love the different settings and adjustments. I can tailor and fine tune it to my preferences. I’m getting to sleep much quicker now. Sometimes I don't mind spending a little money to see if something works. I have OSA and use a CPAP, honestly the only benefit I get from is it that I don't snore with it. My sleep pattern is still just as jacked up as it always has been. I'm super restless at night, I wake up several times a night. It's a pattern that I'm pretty much used to. The other day I ran across a video on YT about Binaural Beats. I thought it was kind of interesting so I did a bit of research. One thing I am obsessed with is tracking my vitals. I use the Apple Watch to track all sorts of metrics while I sleep. Now here's what I have seen so far. My first night I used this app I used ear buds because they fit better with my CPAP, 4:20 minutes is all the sleep I got. Which is pretty typical for me. Here's the kicker. I was restless twice, once at the beginning as I fell asleep and once right before I woke up. My heart rate dipped 21% which it has never done while sleeping. 12% was my Max before this. Now am I saying that this is a cure-all? No, did this Binaural beat have some effect on my brainwaves last night? It's looking that way, So far I am impressed. I will continue to use this, track my results and rate a 5 if all goes well. Regardless, best $5 I have spent in a while. Used this app for years. Got a new phone with latest iOS and it doesn’t respond anymore. Can’t even get to settings to email support. A shame since it’s such a great app. And yes, I tried reinstalling it 3 times. My experience with this app it’s amazing! If I need to rest, concentrate for writing or take a nap... You only program your goal, put your headphones and just flow. I have been on prescription drugs to sleep and wanted to get off of them. I struggle to fall asleep, and struggle to stay asleep once I fall asleep. This app has changed my life. I’m able to fall asleep and stay asleep and am no longer on sleeping meds!! I’ve been using sleeping music for over 20 years. This is a great addition to the stock. Also.... if you play this app and also your iTunes behind it, it’s a great combo! This app has been very useful to me for over a year now. It gives me something to focus on in order to stop focusing on my thoughts. It's not intrusive though, and has helped me immensely. I've used this app well over a year (closer to 4-5 years). & I love it. I sometimes have technical issues with it, but simply installing the updates seem to correct them. I would recommend.